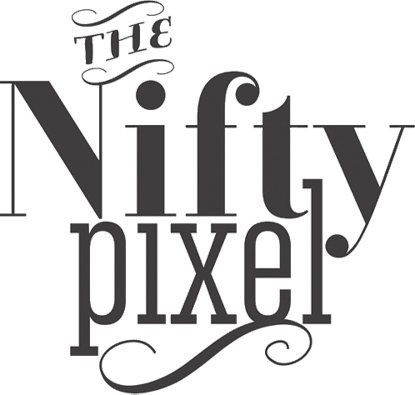 The Nifty Pixel| Thinking Outside the Square: BLACK FRIDAY / CYBER MONDAY SALES + NEW CU GOODIES! 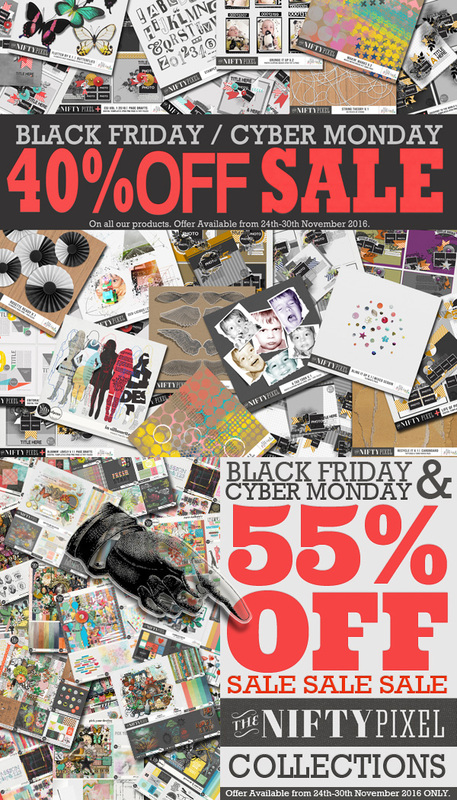 BLACK FRIDAY / CYBER MONDAY SALES + NEW CU GOODIES! It's Black Friday/ Cyber Monday sale time and we've extended our sale at TDC until the 30th to pass on some huge savings to you guys + to make you squeal even more we are offering up a CHICK BLITZ SALE! Now that is getting into the festive spirit! 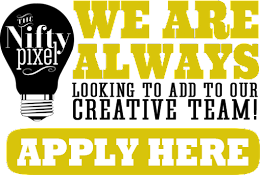 You can grab these following great bargains at The Nifty Pixel shop...to start with we have a 40% off store wide that includes our CU goodies yep thats right and to make it even sweeter you can get a whopping 55% off our Collections. 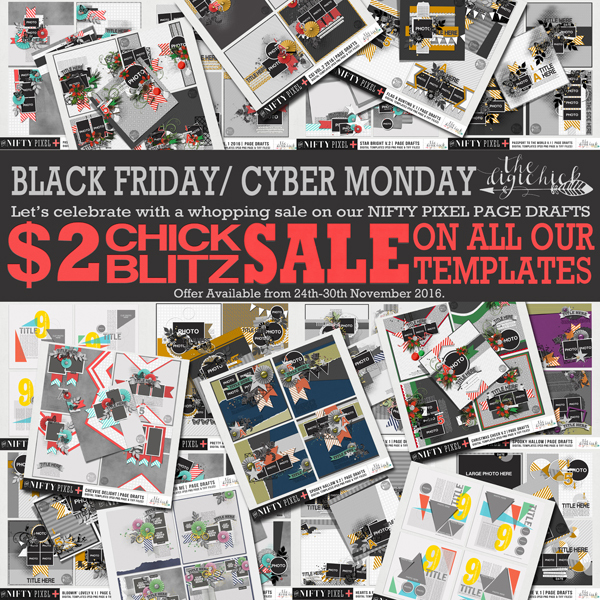 I am also putting all our templates into the $2 CHICK BLITZ sale that runs for 4 days ending Monday 28th November. 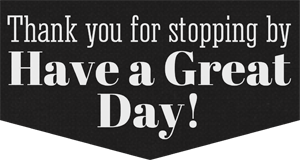 All this because I want to say a huge big thank you for all your support this year! 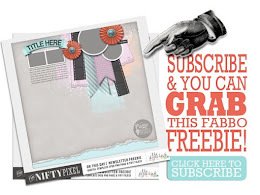 So help yourself to some fun nifty packs, page drafts templates or a collection or two and add them to your nifty stash! Before you scoot it's commercial use week here at The Nifty Pixel and that means lots of fun new products to share with you. These packs are not only ideal for all your designer needs but will work just as well for your personal use projects too so check them out for inspiration! We have a set of CU EUROPEAN MAPS, a funky pack of CU HARMONOGRAMS. A pretty pattern pack called CU MOROCCAN SCREENS and lastly PAINT FUSIONS V.1 Textured Overlays for adding some grunge goodness. 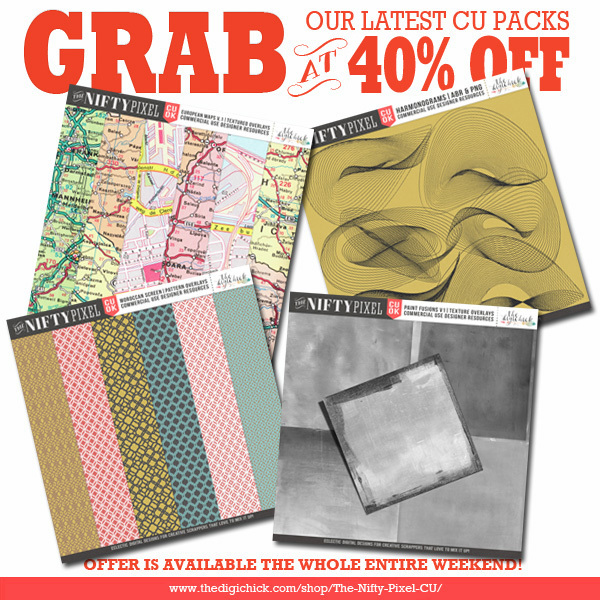 You can grab these CU goodies along with all our other products on sale at The Digichick starting at 40% off, the entire week ending the 30th December.